The moon was in the Seventh House, and Jupiter aligned with Mars. Yes, that's right - New England Bites actually visited a chain restaurant - Chili's in Somerset, MA. Why did we go against the grain and stop into this popular establishment? Because, for once, it wasn't crowded. If you live in the area, you know that the Somerset Chili's is always busy. However, after seeing only a few cars in the parking lot, we decided to stop in. We walked under the giant red chili pepper and through the doors at around 4 p.m. Although I love Chili's, visiting the restaurant always reminds me of the time when I was dining at the East Providence location, decided to be "cool", and sent a drink over to a friend of mine. I saw it done on television many times, and I always thought it was a pretty slick move. As the man stumbled over to me, I quickly realized that it wasn't my friend - it was some drunk guy. The entire restaurant, including the Chili's staff, was in stitches. I apologized for mistaking him, and he was fine with it ... but his girlfriend wasn't. I thought she was going to stab me in the ladies' room and leave me for dead. Needless to say, I stopped trying to be "cool" and instead, have embraced my lameness. After being greeted by a friendly hostess, Mom and I were seated at a table and told that our waitress - Janet - would be joining us shortly. The hostess left us with two large, colorful menus to peruse. The Chili's atmosphere is very bold and eccentric. 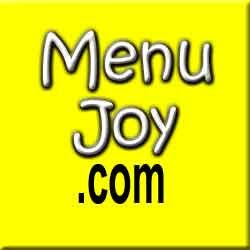 Since the menu is mainly Tex Mex-based with foods like tacos, fajitas, and baby back ribs (I want my babybackbabybackbabyback ... remember that? ), the interior is just as spicy. One of their main claims to fame is the Presidente Margarita which you get to shake at your table, so of course, little blue shakers are scattered throughout the restaurant. 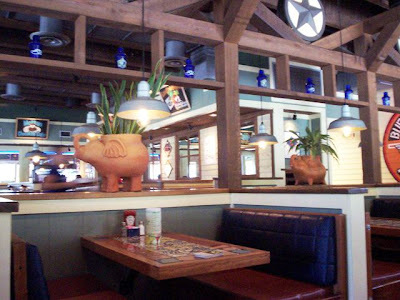 Colorful booths and tables and jazzy music make Chili's the perfect place to go after a long week of listening to your boss complain about nothing. Cute chalk signs advertising the specials are hung here and there, and the bar area is always lit up with social activity. It almost makes me wish that I had a job so that I could come here after work and have fun with my co-workers. Plus, Michael Scott from The Office (my favorite show) loves this place, and if he likes it, it has to be awesome. Janet soon joined Mom and I to take our drink order. After turning down her suggestion to order some margaritas (which we probably should have), we went with our usual diet colas. Mom and I still needed a few minutes to decide what we wanted, so Janet left us alone to make up our minds. 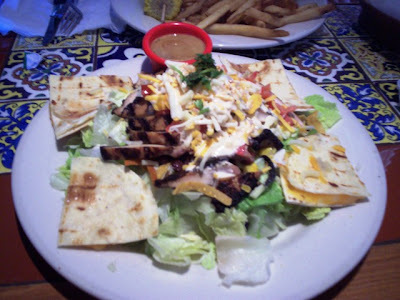 At the last second, I decided to order the Quesadilla Explosion salad ($8.99), while Mom chose the Chicken Crispers with honey mustard dressing ($9.99). 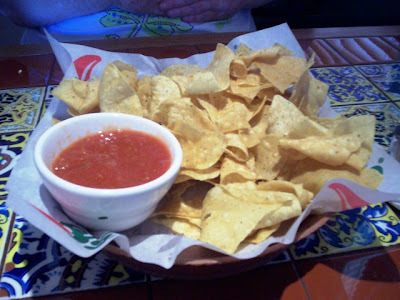 To kick off our awesome meal, we chose the bottomless basket of tostada chips with homemade salsa ($2.99). The chips arrived quickly and were warm (which Mom loves), thin, and crisp without being greasy. The salsa was more tangy than spicy, but it definitely had a lot of flavor. This starter is certainly addictive, and if we had finished our serving, another basket would have been brought out. Since we were still pretty much the only ones on our side of the restaurant, Janet jokingly came over and told us to quiet down because we were making "too much noise." We laughed and told her that everyone was probably out enjoying the beautiful day since we hadn't had one in a long time. She agreed, and told us that the place would probably pick up more toward dinner time. A few minutes later, Janet returned with our dishes. Mom's chicken was accompanied by a pile of tasty fries and a large ear of corn that was sprinkled with butter and pepper. The honey mustard dressing was both sweet and sour, while her white meat chicken strips were lightly coated, allowing the full flavor of the chicken to shine through. It was crisp, tasty, and an excellent portion. Oh my God, I don't even know what to say about my Quesadilla Explosion. First of all, it was served with a cheese quesadilla that was quartered and placed around the salad. It was soft, gooey, and perfect. The chicken was fajita marinated, and the salad was filled with corn relish, cilantro, diced tomato, crispy tortilla strips, and an ancho-chile ranch drizzle. I topped it with the accompanying citrus-balsamic dressing. It was so full of delicious flavors that somehow all went together beautifully. The tender chicken was cooked perfectly, the vegetables were fresh, and the portion was extremely large. This definitely wasn't a "healthy" salad, but you'll probably save on calories throughout the day because you'll be so full that you won't want anything else. 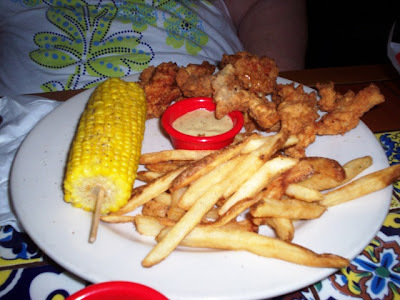 It is really excellent, and I can see why it is one of Chili's most popular choices. Fans, please remind me that if I ever go on a date not to order salad. I shovel it in like it's going out of style. That's not necessarily the impression I want to leave, but I can't help it. It's too good! Speaking of shoveling in food, a woman at the table behind me had ordered a few large plates of food - for herself. Now, we're not sure if she was doing a review or not, but either way, she was definitely enjoying every bite. Good for her, although if I was going to pig out like that, I would have gotten a take-out order. I'm not brave enough to eat all that food in one sitting ... in public. We left $33 on the table for Janet, which included a 20% tip. She was an excellent waitress and I definitely hope that business picked up so that her day would go by faster. Before exiting the restaurant, Mom and I visited the ladies' room. It was nicely clean and well kept. I should mention that Mom almost had a throwdown with the woman who sat directly behind her. When Mom was standing up, she pulled her chair out and it made a scraping sound against the floor. Apparently, this annoyed the woman who - along with her husband - decided to stare Mom down until she left the area. How rude! Mom didn't complain when the woman smacked her on the back with her chair when she first sat down. What a moron! As we headed out to the parking lot, we noticed that there were more and more cars pulling into Chili's. We marveled at how we finally got a chance to visit a chain when it was quiet, because that is the kind of atmosphere we enjoy the most. Sure, loud and noisy is OK sometimes, but we like when we can sit down, eat a great meal, and talk to each other without screaming. Today was certainly one of those days. The Chili's in Somerset is located at 825 G.A.R. Highway. 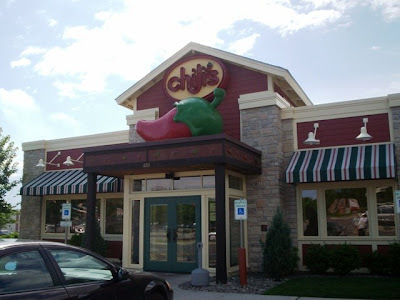 For more information, call (508) 679-0474 or visit the Web site at www.chilis.com.